Spray 5-quart slow cooker with cooking spray. Place carrots and potatoes in slow cooker. Season vegetables with 1/2 teaspoon of the salt and 1/4 teaspoon of the pepper. Season chicken thighs with remaining 1/2 teaspoon salt and 1/4 teaspoon pepper. In 10-inch skillet, heat oil over medium-high heat. Place chicken skin side down in skillet. Cook chicken 8 to 10 minutes, turning once, until browned on both sides. Transfer chicken to slow cooker. In small bowl, stir together chicken broth, lemon peel, 2 tablespoons of the lemon juice and the thyme. Pour over chicken. 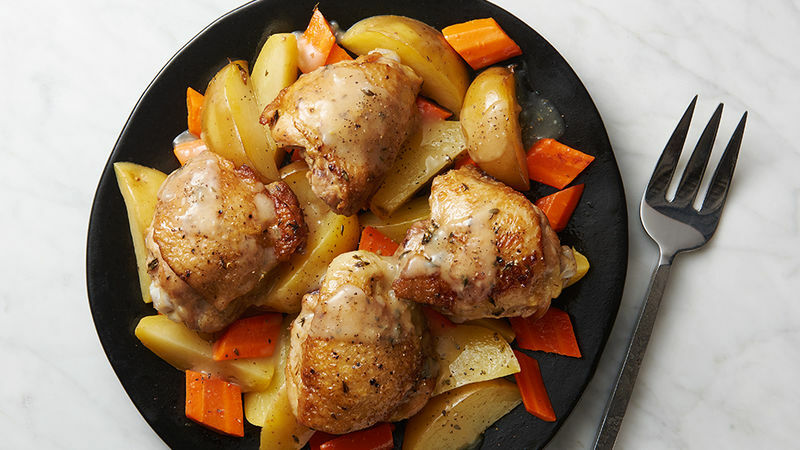 Cover; cook on High heat setting 3 1/2 to 4 hours or Low heat setting 5 to 6 hours or until chicken is cooked through and vegetables are tender. Transfer chicken and vegetables to serving platter; cover and keep warm. In small bowl, beat cornstarch and water with whisk; stir into cooking liquid in slow cooker. Cover; cook about 15 minutes or until thickened. Stir in remaining 1 tablespoon lemon juice. Serve chicken and vegetables with sauce. Because slow cookers are a sealed cooking unit, liquids don’t evaporate during the cooking process, which results in a thinner sauce. Transferring the chicken and vegetables out of the slow cooker and thickening the sauce with a little cornstarch gives it a thicker, more luxurious texture. Yukon gold potatoes, like red potatoes, have a waxy texture that holds up well to slow cooking. Russets or baking potatoes tend to fall apart and get mushy when cooked a long time in liquids.